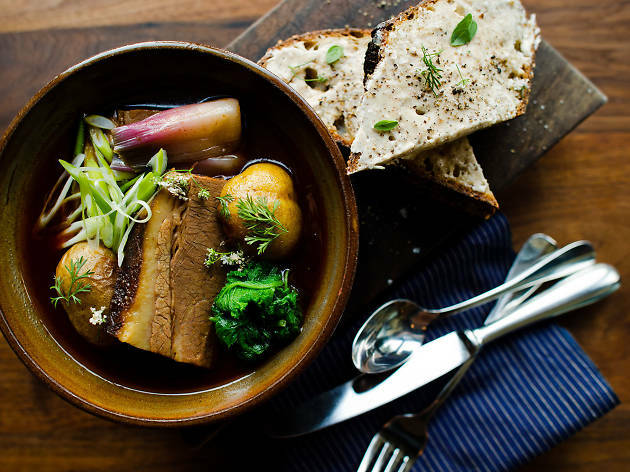 This Mission restaurant is all about the celebration of craft: co-chefs Nick Balla and Cortney Burns make everything in house, whether it’s pickled, fermented or aged. The menu has a globetrotting style, with Eastern European, Danish and an occasional Japanese provenance to seasonal dishes, all featuring fresh and local ingredients—many from the farm they have a relationship with. The way to go is the friends and family tasting menu for the ultimate tour de force. It’s especially fun with a small group (the main menu feels a bit lean in comparison, unless you just want a bite to go with your glass of wine). Saturday or Sunday lunch is another tasting menu affair, and a fun way to while away an afternoon at the table. Solo diners can sometimes find a perch at the bar, while the low-lit room is quite perfect for a date.